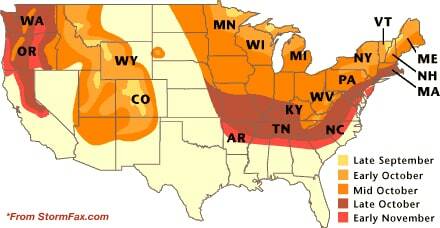 Folks living in deciduous areas look forward to the beautiful changing colors of autumn. But most people don't look forward to cleaning up all those leaves. Depending on where you live in the United States, leaves fall at different times. Foliage color change is caused by a reduction in the amount of light leaves absorb. As days get shorter and nights get colder, the leaves prepare for winter by stopping the production of chlorophyll (what makes them green). As chlorophyll production ceases, the red, orange and yellow colors of autumn become visible. And once leaves start to reach their color peaks, they will fall. Other factors, such as temperature and rain fall, have a lesser impact on when leaves fall. For example, a drought could cause the leaves to begin changing a week earlier than normal. Broad leaves are too thin and would not be able to survive the freezing cold of winter, that's why trees ditch them. This is also why pine trees keep their needles throughout the seasons; they are covered in a waxy coating, preventing them from freezing. With the beautiful colors of fall comes the inspiration for the season's name. Leaves that change color are soon to fall. When they fall, you find yourself faced with a dreaded chore unless you have the ideal tool to make this chore a breeze. If you'd like to find that perfect leaf-removal tool for your property, you can take a look at our Leaf Blower Buying Guide. This guide will help you determine the best style of leaf blower for your property so you can breeze through fall cleanup work without breaking a sweat. No Tree Leafed Behind - View Our When Do the Leaves Change Near Me. Our leaf blower how-to library can help you pick the perfect leaf blower, walk behind leafblower, cordless leafblower, battery powered leaf blower or leaf blower accessory.